The Azorean Portuguese speak with great delight of this dish. Licorice flavor dominates this soup, and it is the Azoreans’ most common use for fennel. The slightly sweet flavor comes from the feathery fennel leaves. The variety of fennel found in most supermarkets (sometimes incorrectly labeled anise) has a large, somewhat flattened white bulb at the base of the leafy stems. This is a good substitute for the wild version. Unfortunately, some markets remove most of the leafy stalks from the plant. Shop around for bulbs with the most greens; if you have the benefit of a local farmers’ market, you may find fennel bulbs with the fine leaves still intact. 1. Soak beans overnight in enough water to cover by 2 inches. 2. Rub the meat with 2 tablespoons coarse salt and chill overnight. 3. Drain and rinse the beans. Set aside. 4. Wipe any excess salt from the ribs (or pig’s feet) and place in a 4-quart stock pot with the beans and water. Cover, place over medium-high heat, and bring to a boil. Reduce the heat and simmer until the meat is tender and the beans are easily mashed (about 1 hour). Occasionally skim the surface of any impurities. 5. Meanwhile, trim and discard coarse stems from the fine feathery fennel leaves. Finely chop enough leaves to yield 2 cups. (If you are using fennel bulbs, discard the outer layer. Separate sections of the bulbs, rinse well, and coarsely chop.) Set fennel aside. 6. Add the onion, garlic, bay leaf, cloves, and black pepper to the pot. Simmer 5 minutes, then toss in the fennel leaves, and chopped bulb if using, along with the cabbage, potatoes, scallions, olive oil, and sausage. Return the soup to a boil, reduce the heat to medium-low, and continue to simmer until the potatoes are done and the cabbage is tender, about 20 minutes. Usually this soup needs no additional salt, but taste and season to your preference. Replace the salted pork with an additional 2 tablespoons of olive oil. Portuguese Fennel Soup Recipe © 2001 Ana Patuleia Ortins. All rights reserved. All recipes and photos used with permission of the publisher. I’m excited to give this recipe a try. I grew up eating this soup..since my mother passed away of Alzheimer’s I have been craving a good Portugese soup!! Karen, so sorry about your mom. I’m glad we can offer this recipe, and I hope it helps you feel a bit closer to her. Please let us know how it turns out. Thank you so much for this recipe. I love this soup… my ex boyfriend is from Saõ Jorge and his mom used to make this!! Now I can try it myself and being vegetarian doesn’t even make a difference because it’s just as good without the linguiça or ham. So glad that you found it, Lucy B. 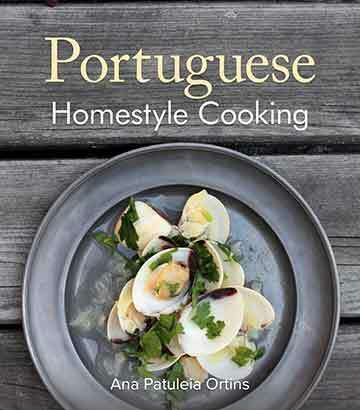 Have you had a look at our other Portuguese recipes? You might recognize some other dishes as well. I’m going to try to make the soup today without the pig’s knuckle. My husband’s mother (who passed away) would make this for him when he was growing up and he’s mentioned it often. I’ll let you know how it turns out. Also, I tried something once called pudim de fagao…bean pudding. Even though I had eaten a hearty thanksgiving meal, this dessert was very difficult to ignore. Do you have that recipe? You have no idea how much I would appreciate having it. Thank you! Karen, I think you want a recipe for pudim de feijão. I don’t have a recipe for it. But this might work. And I hope your husband likes the soup!